As per the study published by researchers at University of Maryland, US, India is overtaking China to become the world’s largest emitter of anthropogenic Sulphur Dioxide (SO2). India’s first Tribal Entrepreneurship Summit was organised at Dantewada in Bastar region of Chhattisgarh. The summit is part of 8th Global Entrepreneurship Summit in India. The event was organized by National Institute of Transforming India (NITI) Aayog in partnership with Government of United States of America (USA). The Reserve Bank of India (RBI) has decided not to pursue a proposal to introduce Islamic banking in India. Sharia prohibits the fixed or floating payment or acceptance of specific interest of fee for loan of money. Further, it forbids earning of interest through the business of lending. 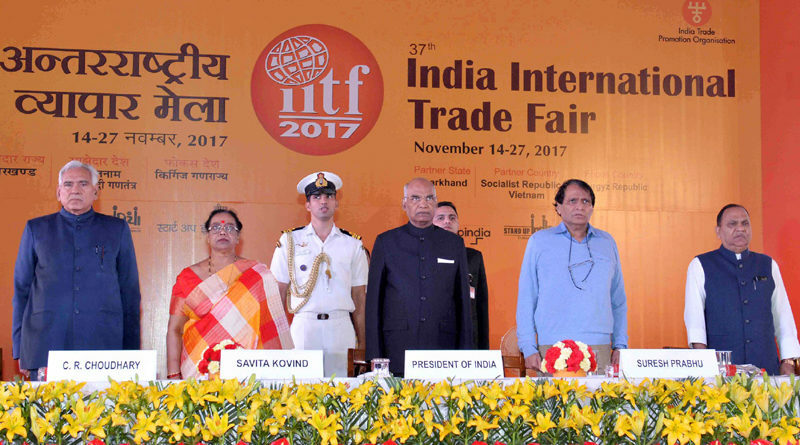 The 37th India International Trade Fair (IITF) began at Pragati Maidan in New Delhi. The 14-day annual event was inaugurated by President Ram Nath Kovind. It is organised by India Trade Promotion Organisation (ITPO). The theme of this year’s fair is “Startup India Standup India”. The World Diabetes Day was observed every year across the world on 14 November to raise awareness about diabetes. The theme for this year was “Women and diabetes – Our right to a healthy future’. This day was instituted by United Nations General Assembly (UNGA) in 2007 by passing resolution A/RES/61/225.